Major pharmaceutical manufacturers use chillers to maintain the temperature in the laboratories and production facilities throughout their campuses. The loss of the ability to maintain optimal temperatures within these facilities, especially laboratories, can mean the difference between a successful production run or millions in lost revenue, not to mention the impact on new pharmaceutical discoveries, or equipment failures and delays. 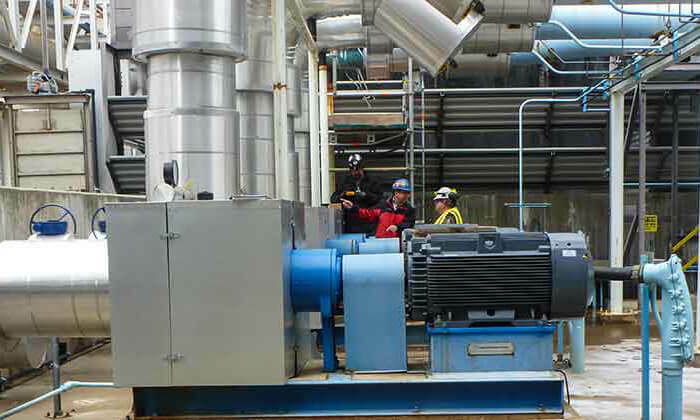 An aftermarket services provider was called in to such a facility to assess a series of five pumps. The subject pumps, which were tagged Nos. 14 through 18, are driven by a 200-horsepower (hp) induction motors (Image 1). They are operated individually or in parallel based on chiller requirements. Pumps Nos. 15 and 18 were tested during the assessment and site personnel reported elevated vibration amplitudes, cavitation noise, impeller damage, and short bearing and seal life. The suction inlet source is a common channel between two cooling towers. 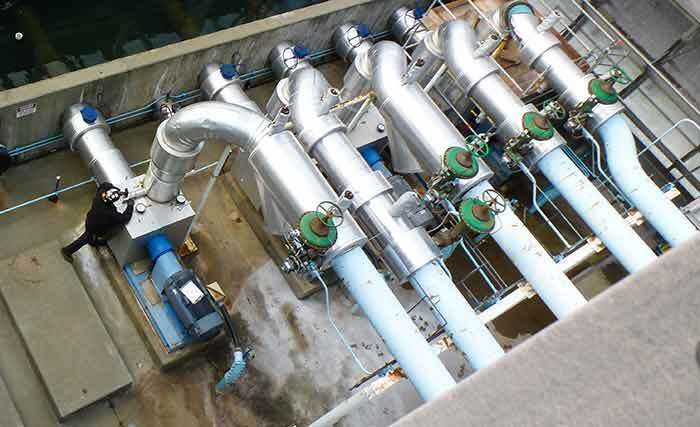 The suction inlet to each pump is a 20-inch pipe with a scalloped opening at the 6 o’clock position running perpendicular across the channel (Image 2). It was suspected that the existing suction inlet design was the root cause of the damaging cavitation occurring within the pumps. Image 3. Both pumps were operating at or near expected levels and with sufficient NPSHa. 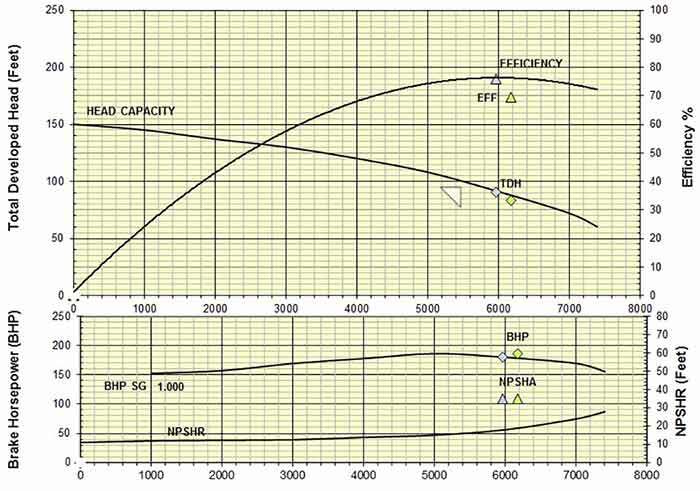 As indicated in Image 3, both pumps were operating at or near expected levels and with sufficient net positive suction head available (NPSHa). The unfiltered velocity amplitudes from both pumps were at or below 0.16 inches per second (ips)-peak, which was measured on pump No. 18. However, a review of the associated time waveforms and spectra (Image 4) provides insight to the composition of the vibratory energies. Image 4. The spectrum presented reveals a significantly raised noise floor and random impacting in the time waveform, both indicative of hydraulic instability. 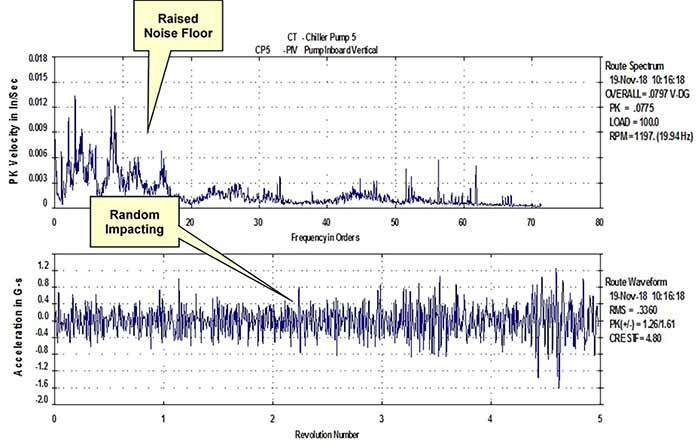 The spectrum presented in Image 4 reveals a significantly raised noise floor and random impacting in the time waveform, with both indicative of hydraulic instability. NPSHa is defined as the total suction head in feet of liquid (absolute at the pump centerline) less the vapor pressure. Net positive suction head required (NPSHr) is determined by the pump manufacturer and is a function of several factors, including impeller eye design, flow, shaft speed, etc. For all operating conditions, the NPSHa must exceed the NPSHr. Submergence is the minimum intake or suction depth required to prevent surface and subsurface vortices, excessive flow re-whirl and more.